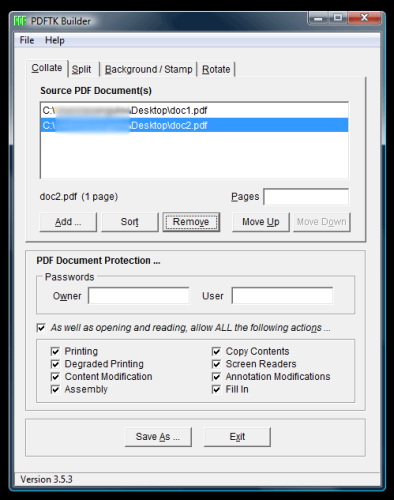 For the most part the program is fairly intuitive, simply select the input PDF docs, choose desired action and click on save button. Though some other features like rearranging pages within the document or merging a part of one document with the other require brief illustration. So let’s quickly go over it. The collate tab is probably the most extensive one. The above screenshot shows how to merge two PDF documents. This basically takes the contents of doc2.pdf and appends it to doc1.pdf. There is also an option to merge only certain parts of each document. For instance, you can set it to take pages 4-5 from doc2 and append them to pages 2-7 in doc1. Simple. 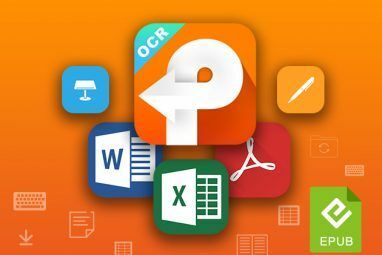 If you want to reorder or duplicate pages within the same document you can easily do so by selecting the document several times and choosing different page range for each. If necessary you can even specify multiple page ranges for selected PDFs. Say you want to remove/delete certain pages from a single PDF document then all you need to do is list the page ranges you wish to retain for that document. The Split tab doesn’t really give any options to choose from. It takes the PDF file and breaks into several single page documents. Period. 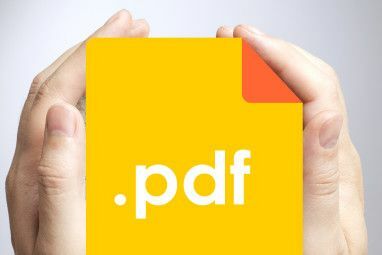 If you’re looking for more flexible PDF spliter I recommend checking out PDF Merge and Split Easily Split And Merge PDF Files With This Easy Tool Easily Split And Merge PDF Files With This Easy Tool Read More . Background / Stamp tab can be used to add a background or watermark (appears on top of the page) to a document. You can choose to apply it only to the first page or all pages in the document. The only thing to keep in mind here is that both background and watremark image should be in PDF format. Rotate tab is another no-brainer. Choose the document, select rotation type and enter the range for pages that needs to be rotated. password protected and disable document copying and printing. Did you use the PDFTK Builder before? What do you think abou it? Lets us know in comments. Explore more about: Image Watermark, PDF, PDF Editor, Portable App. Thanks for the review. Just to clarify some of your suggestions which unnecessarily complicate some collating procedures ... if you want to remove some pages from a document, you only need to list that document once and specify the page ranges separated by commas. For example, if you have a 10 page document and you want to remove pages 4 & 5, then specify that pages for that document as: 1-3,6-10. Thanks a lot Aibek for the news! ...make sure not to forget the link to the portable version, available over at PortableApps.com. Thanks for heads up, though you can also download it from the source website itself. It comes as a portable app by default.